Right Lights – A new shoe-wearing experience for kids! If you have been around children for any length of time, then you know that the journey towards learning which shoe goes on which foot can be quite a grueling one. For some reason, it seems that some kids insist on ignoring your directions and patient explanations in order to put their shoes on their way (most often the wrong way). This is a problem that I have seen time and time again, which is why I created the Right Light shoes. This handy pair of kicks is designed specifically for those children who struggle in the area of putting on their shoes correctly. The concept is that the child will put on the shoes and, if they put them on the right feet, they can touch their toes together and watch a bright display of LEDs blink on their shoe. If, however, the shoes go on the wrong feet, no amount of toe-touching will make those LEDs light up. The way that these shoes work is fairly simple. I used the Adafruit Gemma as my motherboard and connected a simple watch battery to it to power it. 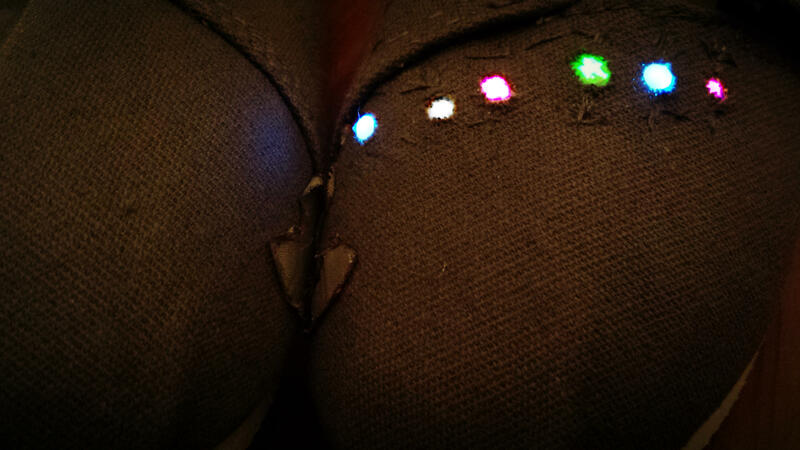 The negative ends of the multicolored LEDs are connected via conductive thread in the usual manner (all negative ends connected to “ground” on the Gemma), however the positive ends are connected in a slightly different way. 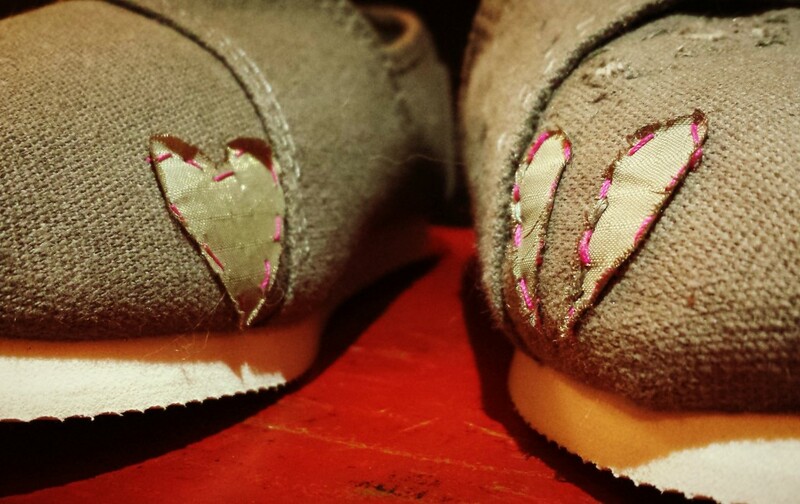 Instead of connecting the positive ends directly to the positive petal on the Gemma, I connected them to one half of the heart shape on the left shoe. The other half of the heart is connected directly to the positive petal on the Gemma, which was programmed with the “blink” code. 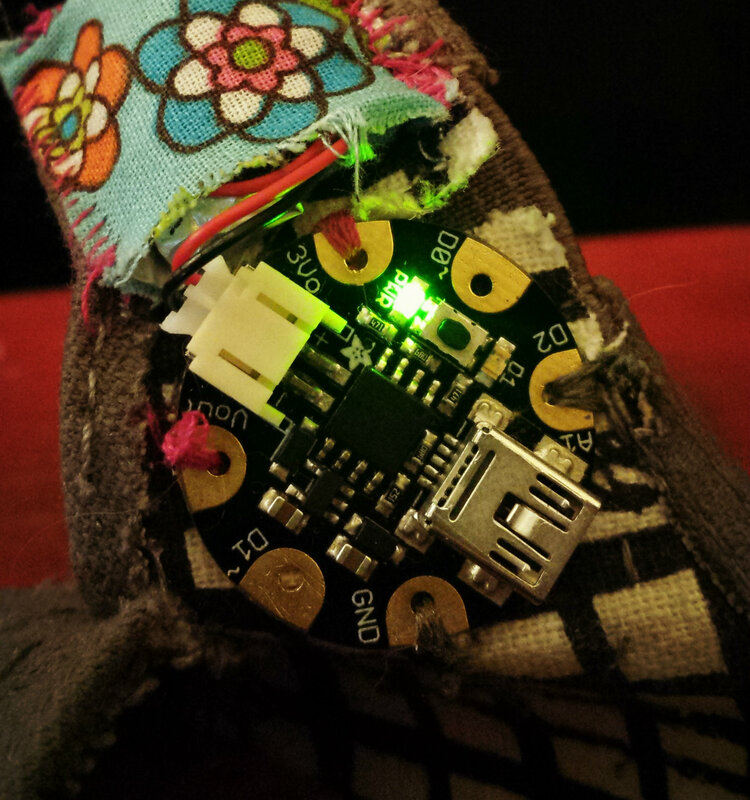 The other shoe has a whole heart shape, also made with conductive fabric, so that that, when pushed against the two heart-halves, it allows the connection to be made between the two halves, thus allowing the positive ends of the LEDs to be indirectly connected to the positive petal on the Gemma. While this may sound rather complicated, the it is primarily a matter of disrupting and then completing a simple circuit. When making these shoes work properly, I did run into a few problems. The main problem was the fact that making my LEDs have proper connection to the conductive thread was exceedingly difficult. It was almost impossible to get my hand inside the shoe enough to be able to make tight stitches when sewing the LEDs into the shoes. Once I made a few adjustments with the shoes (undoing, and later redoing, some seams on the shoes) I was able to continue with much more ease and accuracy. Another problem was that the conductive fabric is highly sensitive and so, once I turned the shoes on, I had to be extremely meticulous about snipping off any loose threads so they would not make an accidental connection. The coding itself was not very difficult because I only really needed to program one pedal on the Gemma and, once I got my computer compatible with the Adafruit system, that came very easily. Using the “blink” code on the Arduino program was the most obvious choice and, aside from compatibility issues with the Adafruit system, all I really had to do was write in the one pedal and choose how rapidly I wanted my lights to blink. My main mission with these shoes has been to make learning a fun and colorful experience for children. It seems that education is becoming more and more dry and “black and white” when it should be bright, fun, and above all INTERACTIVE! These shoes are a way of teaching the child a relatively valuable concept in a way that they can actually grasp and understand. This little bit of education, I believe, has become a bit mundane for most parents and, therefore, children often do not understand how to correctly put on their shoes until they are much older than is necessary. With a technology like these shoes available, it will open up the opportunity for this lesson to be taught successfully and in a way that will make the child excited to do the task correctly the first time. Throughout our Fashioning Circuits class, we have gone over a lot of writings that reflect the idea of technology and fashion coming together to make life more entertaining and convenient for people. There is also quite a bit of emphasis on creating wearable tech that is both functional and pleasing to the eye. In the article by Lauren Silvermen entitled, “Where High-Tech Meets High-Fashion“, she quotes designer Jennifer Darmour when she says, ““if we are going to be making these wearable devices and gadgets and we’re asking people to wear them, they need to look good.” This is an issue that I attempted to address with the Right Lights when considering their general design. I purposefully put the Gemma, battery, and LEDs underneath the fabric so that the outside looks far less like a pair of walking robot shoes and more like a pair of everyday children’s slip-ons. This information regarding wearable tech needing to be visually appealing, combined with a large amount of information regarding how to code, and also how circuits function, from the book, Open Software, enabled me to have the tools necessary to create these shoes. They are intended to simply create a fun, interactive, and colorful shoe-wearing experience for children, no matter what their age.